Charles River, Boston, Mass. - The Rockland Rowing Association had two crews race at the prestigious 53rd Head of the Charles Regatta on Sunday. The warm weather drew crowds and a light tail wind made for fast racing conditions. Rockland's women's youth four finished 54th in a 84-boat field and the directors' challenge men's quadruple sculls finished 15th in a field of 37. 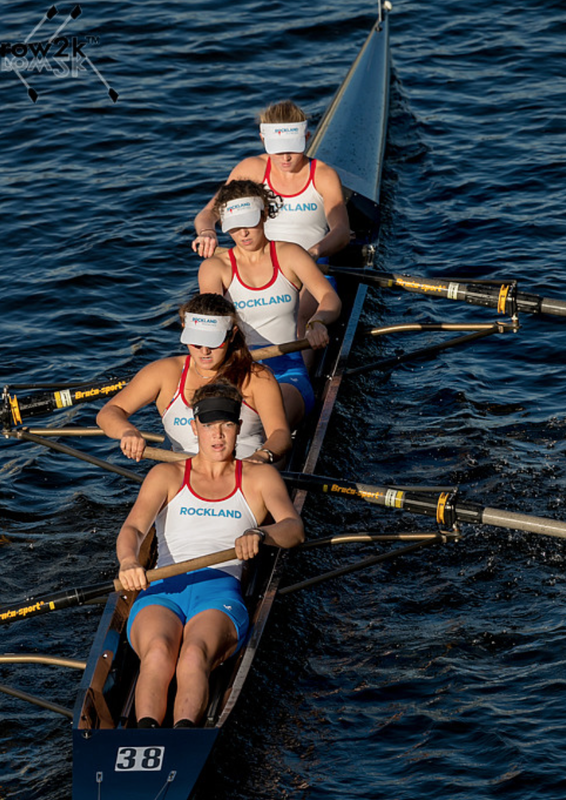 This year marked the fourth straight season Rockland has raced in the women's youth four event. Chloe Young Ridgewood '18 (stroke), Ariel Deljanin Northern Regional '18 (three), Lucinda Carroll Nyack '19 (two), Gabriele Welp IHA '19 (bow) and Emilie Mazzola Briarcliff '18 clocked in with a time of 20:28.695 on the 4800 meter course. The crew was competitive amongst regional foes, finishing six seconds ahead of South Jersey (20:35.166) and five seconds behind Mountain Lakes (20:23.293), but was 26 seconds back from the last qualifying crew to guarantee the entry for a fifth year. Deljanin was the only returning crew member while the other girls made their Head of the Charles debuts. "We had to replace four of the five crew members who rowed for us in last year's regatta," said head coach Melissa Boyd. "With this crew 54th place is good. It was an impressive effort by the girls against top-notch talent and the often-challenging course was well-navigated by first-year coxswain Mazzola." Deljanin said, "It's really a once in a lifetime opportunity to go out and be amongst so many amazing people in the rowing community. Sitting at the starting line and seeing that many boats in one place is insane and I was so grateful to get to experience that for a second time. I am also so proud of our two novice rowers we had in the boat for keeping their composure at a race of that caliber!" Competing in the directors' challenge men's quadruple sculls, Rockland's master's men covered the course with a raw time of 17:02.334 and an adjusted time of 16:21.334. The crew of Tom Chyla, Peter Klose, Justin Bohan and Ivan Rudolph-Shabinksy rowed for charity. Rudolph-Shabinsky also raced in the men's seniors masters four with fellow Cornell alumni and finished fifth-place in a field of 43. His daughter Alice, a current Cornell rower and Rockland Rowing alumna, took silver in the women's championship four racing for the Big Red. The rowers will rejoin their counterparts for the final regatta of the season on October 29 at the Head the Schuylkill in Philadelphia, PA.